I am in the slow lane. 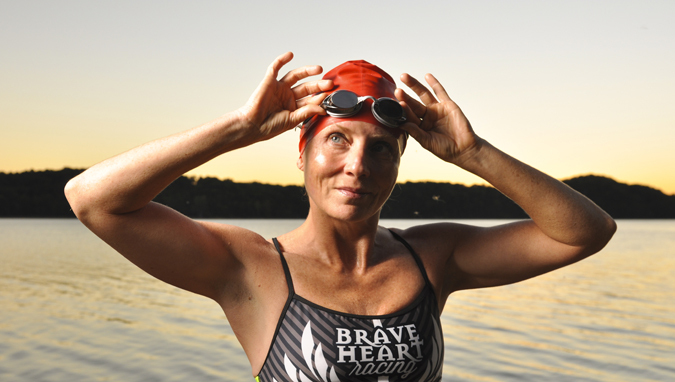 As a triathlete, I am challenged in a lot of ways, but I am most challenging by the swim. I grew up thinking I knew how to swim until I started training for my first triathlon a few years ago…the ego got in check real fast. I could hardly breathe while doing 25 meters! I have come a loooong way, but admittedly, it is my least favorite part of the triathlon. The good part is that it works other muscles and keeps me from running too much (running is my favorite part of the sport but the one that can leave me injured if I do too much of it). However, because my progression is so slow with swimming, (and yes, that means I am a slow swimmer), I have dread at times. I just don’t want to do it. How do we get past these voices in our head that insist we should not go swim? My trick: I reach out to others when I need a push and I will start telling myself that “I AM GOING TO SWIM TODAY.” I will say this several times until the thought of not swimming goes away and it always does. This can be applied to anything: a business plan you are working on, a chore, other forms of exercise or even how we eat. Another approach is understanding if it is praise and a sense of accomplishment that you are seeking. Regardless, we all like to be told that we are doing a good job, but some more than others. I am one that appreciates it and definitely gets inspired by it, but through a lot of personal and professional circumstances, I have learned that I am here to do the best that I can and to help others be the best that they can be. I am not here to be told that I am great. It just doesn’t matter as long as you are doing your best. It’s true: arriving is half the battle. Every day is not going to be amazing or even your best, but most days sure can be. When you need a push, reach out to your friends, family, coach, neighbor…whatever it takes! I dreaded going to my swim today and almost talked myself out of it. Then I decided to reach out to a couple of friends and express how I felt. They gave me encouragement and ideas; the next thing you know, I have completed a 3650 meter swim in pretty good time. Yep- I was in one of the slower lanes at the pool, but I wasn’t the slowest. The workout gave me encouragement and the realization that arriving at the start is definitely half the battle– awesome; that means 50% of the work is already done before I have even jumped in the water! What I have accomplished in the pool and in open water swims is beyond what I expected and I hope to accomplish much more. We have to remember that you’ve gotta start somewhere and to never give up.